A man crossing the light rail tracks along Hiawatha Avenue was struck and killed by a light rail train last night. Authorities said the incident happened about 6 p.m. at the intersection of the tracks and E. 42nd St. when a pedestrian walked onto the tracks in front of an oncoming southbound Blue Line train. Authorities would only identify him as an adult male and said he was killed in the collision. "The gate arms controlling the intersection were in the lowered position and the train came to a stop a short distance beyond the intersection after striking the man," said Metro Transit spokesman John Siqveland. 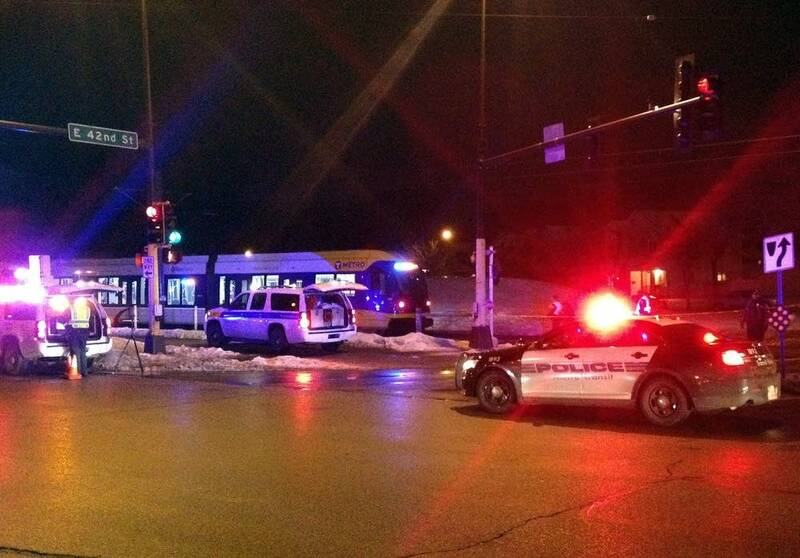 "Metro Transit police are investigating the situation, and so is Metro Transit's rail safety division. As per standard procedure, the rail operator has been removed from work and will undergo drug and alcohol testing." Buses replaced rail service between the Franklin and Fort Snelling stations for several hours. The incident is the tenth fatality involving light rail trains since they started operation a decade ago, and six of those have been pedestrians. It's also the second fatality at the same intersection. An 87-year-old Minneapolis man, Hilmer Iverson, turned his car into the path of an oncoming train there in 2004, the first fatality along the train line.